How an intertwining host of problems—and harmful “solutions”—have compromised our planet. The instructive history of biochar as ancient technology, and how that technology can be adapted and used today. The interlinking soil-enhancing and environmental benefits of biochar. These problems—of our own making—are complex, proliferating, and alarming. But a surprisingly simple potential solution to a broad range of problems, a solution built on ancient knowledge, is within reach. In order to look forward to that solution, we must first look back to its origins. 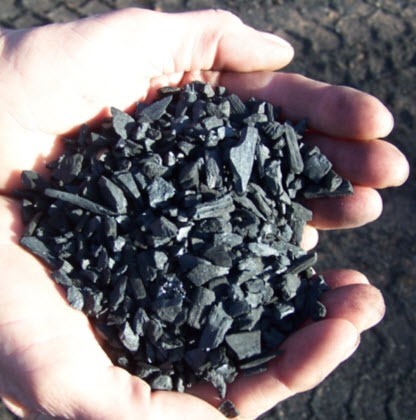 Biochar is charcoal produced for mixing into soil. Charcoal is the carbon-rich material made from heating wood or other plant material in an oxygen-deprived atmosphere. As a soil additive, biochar offers numerous potential benefits. Simply summarized, biochar increases the capacity for soil to hold water and nutrients, enhances crop yields, and captures and stores carbon for the long term. This article will outline the promise biochar holds for rescuing our compromised planet. Biochar is the carbon-rich product obtained by the thermal decomposition of biomass in a system with limited air supply. It has a porous structure with high surface area that interacts with minerals, other soil organic matter, and soil biota. 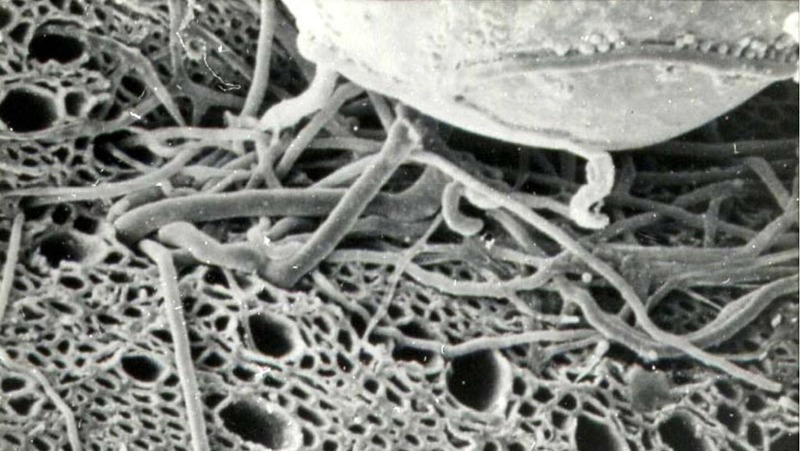 The photo below shows a portion of a fungal spore, and hyphae penetrating the pores of the biochar. Biochar in the soil has been said to be like a “coral reef for microorganisms”, thereby enhancing soil fertility. As a teenager growing up in Australia in the early 1960s, I often thought of the folly and injustice of wastefully burning up our fossil carbon without a passing thought about the needs of future generations, when other alternatives were apparent. As well, my formal training in physics provoked a concern we would inevitably heat our planet in our rush to inefficiently consume energy, while taking the planet’s stored fossil carbon out of the ground and putting it back into the atmosphere. As serious as they are, climate change and ocean acidification are not the only problems generated by the human footprint on the planet. In 2002, World Bank economist Jean-François Rischard identified 20 global issues that, if not addressed and on the way to resolution by 2020 will have drastic negative effects on the fate of our planet and civilization well into the future.4 Rischard divided those issues into environmental (such as climate change, soil degradation and loss, and deforestation), social (such as poverty and over population), and regulatory (such as taxation, international labour, and migration). These problems are laden with unfortunate consequences—and worse yet, they intertwine and reverberate with numerous nasty feedbacks. Attempts at solutions also intertwine with nasty side effects, which undermine our attempts to extricate ourselves. These problems—of our own making—are complex, proliferating, and alarming. But a surprisingly simple potential solution to a broad range of problems, a solution built on ancient knowledge, is well within reach. Biochar represents a rare technological intervention into nature that, if done carefully, could have beneficial feedbacks rather than vicious ones. In order to look forward to that solution, we must first look back to its origins. I first became aware of biochar from the 2002 BBC documentary “The Secret of El Dorado.” In 1542 the scribe of Francisco de Orellana, drifting with him down a tributary of the Amazon wrote: “…there could be seen very large cities that glistened in white…many roads that entered into the interior…and besides this, the land is as fertile…as our Spain.” When the Spaniards returned a 100-years later, they found only a few scattered settlements (the aboriginal people having been decimated by diseases the Spaniards introduced)—and Orellana’s report was relegated to myth. Conventional wisdom held that the typically infertile Amazon soil could never have supported large populations, and therefore these “cities” could not have existed. Conventional wisdom has shifted. It has become increasingly clear that the ancient peoples of the Amazon compensated for nature’s limitations, leaving an enduring legacy of rich soils, known as terra preta de Indio (Indian black earth). In fact, their agriculture methods were adding wealth to the soil, not “extracting” it. This phenomenon may have profound impact for the future of agriculture. Terra preta is found in or near sites where the Amazon Indians had established long-term villages, its link to prehistoric settlement evidenced by a liberal sprinkling of artefacts, including ceramic shards and animal bones. A less rich, brown earth, called terra mulata, is much more extensive. 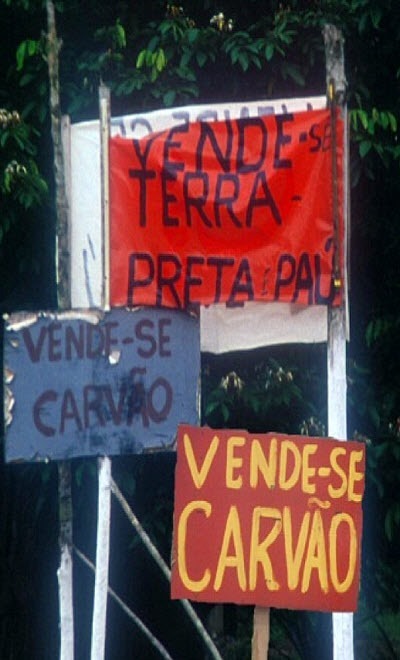 It generally surrounds the village sites where the terra preta is found, contains few or no artefacts, and seems to have resulted from relatively intensive, purposeful cultivation over extended time periods. Fig. 1.1 Terra Preta soils, up to 2 meters deep, are darker and more fertile than the surrounding soil, which is highly weathered and poor. 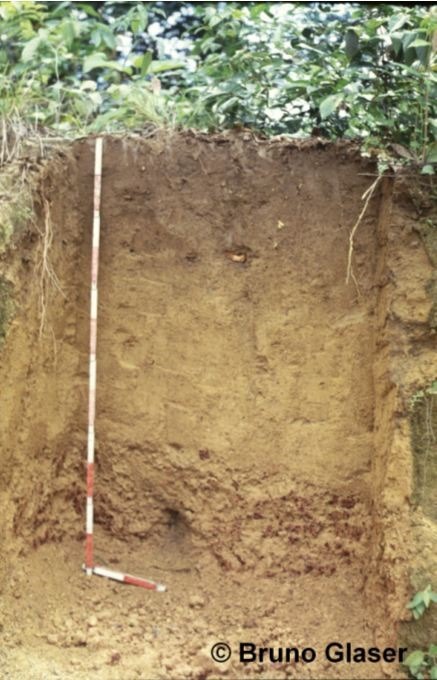 Terra preta soils have generally retained their fertility to the present day, and the rich soil is even excavated and sold as potting soil (see right photo). 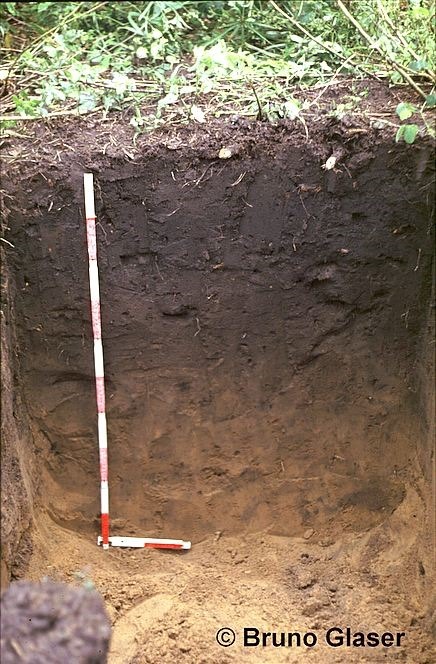 The darkness of terra preta soils and their durable fertility is attributed to their high black carbon (biochar) content, which has been scientifically dated as far back as 450 to 8,000 B.C. It is understood to come from managed fires related to routine village activities such as cooking, firing of clay pots, disposing of refuse, sanitation, field burning prior to planting, and burning crop waste and forest debris. The ancient Amazonians evidently noticed that somehow their routine activities were linked to improved soil. Armed with that knowledge they likely applied it intentionally to improve the soil. In Africa, India, and elsewhere, some native peoples still use fire management practices that purposely carbonize plant and animal waste to make biochar for amending the soil. There are also early descriptions of agricultural charcoal use (biochar) outside the tropics. The 1846 book, Brief Compend of American Agriculture, mentioned multiple uses of charcoal mainly for conserving nutrients, and observed that the pronounced benefits of top-dressing with charcoal led to extensive use of the practice in France. There are even older descriptions of charcoal use in non-tropical agriculture. In 1697, Yasusada Miyazaki of Japan called charcoal “fire manure;” he described roasting organic wastes and mixing them with nutrient-rich manures. Dutch soil scientist Wim Sombroek recognized that the fertile Amazonian soils might have been created by humans because of their similarity to the rich, black, human-created Plaggen soils of his homeland. Sombroek, and other soil scientists analysing the terra preta were astonished at its ability to maintain nutrient levels over hundreds of years. Research has shown that even chemical fertilizers cannot maintain crop yields into a third consecutive growing season in cleared rainforest soils, yet terra preta remains fertile year after year. In 1992, Sombroek drew attention to the potential of terra preta as a tool for carbon sequestration and started the quest to reinvent the ancient terra preta as a strategy for large-scale farming and as a carbon sink to recapture excess carbon dioxide from the atmosphere. In 2004, New Zealand climate scientist Peter Read suggested the term “bio-char” to describe charcoal made from biomass and intended for use in agriculture. The First International Agrichar Conference was held in 2007 in New South Wales, Australia, and attracted 107 participants from 13 countries. At that conference, the name of the association was changed to The International Biochar Initiative (IBI). Its mission is to promote the development of biochar systems that follow “Cradle-to-Cradle” sustainability guidelines. About the time of these conferences, my own long-term concern about emissions-induced climate change convinced me that in addition to mitigating emissions, the land’s ability to absorb and store carbon must be maintained and improved. I was struck by the idea that biochar could be used to improve the land’s carbon uptake capability. The concept is explained in Figure 1.2. Source: Adapted from J. Lehmann. Frontiers in Ecology and the Environment. 2007: 7: 381-387. Solar energy enables plants to synthesize carbon dioxide into biomass. When waste biomass is thermally decomposed (a process called pyrolysis) it breaks down into gases and residual char. In a modern biochar system, the gases produced by pyrolysis are cleanly combusted, which not only provides heat to sustain the pyrolysis but also provides energy for external use—renewable energy! The gases can also be condensed into liquid fuels and other valuable products. About fifty percent of the carbon remains in the biochar and most resists decomposition in the soil for centuries to millennia, effectively locking it out of the atmosphere. At the same time, the fertility of the soil is increased—enhancing food yield and augmenting biomass supply. Without the biochar system, nearly all of the carbon would cycle back to the atmosphere in just years, as fallen and harvested plant material decomposes. Here we have a carbon-capture technology, which appears to have the potential to play a major role in restoring our soils and our climate, while providing renewable energy and avoiding use of fossil fuels. In addition to the environmental benefits, the economic opportunity related to the scale of the coming changes is worth contemplating: sustaining civilization in the face of environmental imperative will require replacing most of the present fossil fuel industry and most of current fossil fuel-driven, unsustainable agriculture. Biochar is not the only carbon-capture technology that will be part of the mix in the coming greener revolution, but pyrolysis technologies seem destined to play a substantial role, and biochar’s array of potential environmental, economic, and social benefits stand apart. Modern biochar systems can transform waste into valuable soil improvement, which sequesters carbon and mitigates climate change, while at the same time producing renewable energy. Social, environmental and economic benefits flow from optimum implementation of the system. Researchers around the globe are now scrambling to verify and understand all of these potential benefits of biochar, so that modern biochar systems can be applied effectively and sustainably. The original terra preta sites are being studied, and soils with similar traits are being sought, and found. Field studies are under way on every continent, with particular enthusiasm in Australia, Asia, Brazil and Europe. Research labs, new companies and individuals are working to develop modern, clean, and efficient pyrolysis processes. 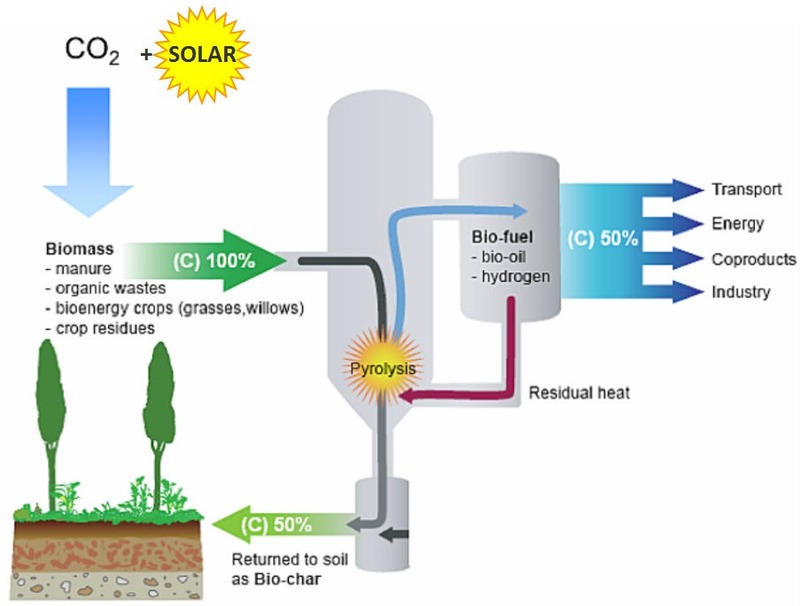 Japan (where biochar has been used for centuries) and China are leaders in commercializing biochar, developing varied biochar-related production kilns, products, and applications. The ease of electronic communication has pushed the biochar cause beyond the ivory towers, infusing both knowledge and momentum. Home gardeners, famers, activists, and entrepreneurs have found a community of interest and are sharing ideas, designs, and results online. 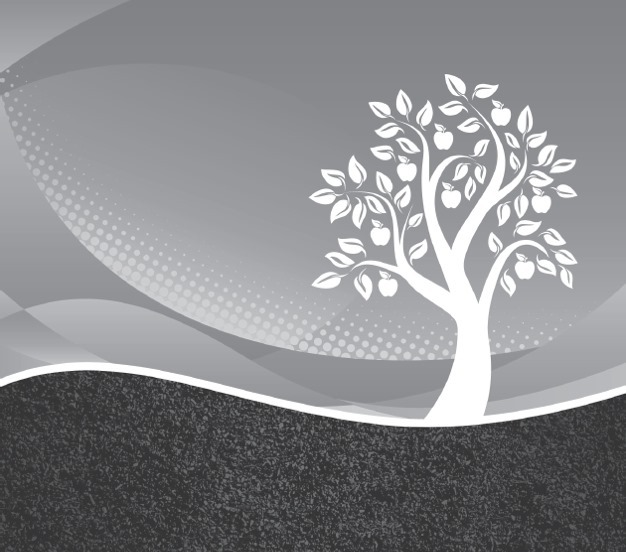 The IBI keeps the biochar community updated through its website and international conferences. 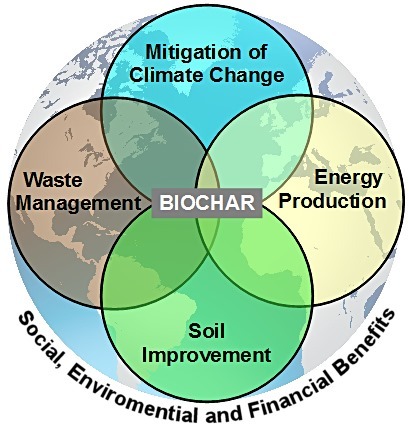 http://www.biochar-international.org As well there are regional biochar organizations around the world, and numerous individuals championing the cause online. In May 2009, I attended The Asia Pacific Biochar Conference, in my local area of Gold Coast, NSW, Australia. The conference brought home to me the diversity in the biochar community. There was no shortage of strictly scientific presentations, yet I found myself sitting next to and chatting with farmers, waste management consultants, economists, entrepreneurs, and even a building demolisher, all keen to see what biochar could do for them. That diversity is significant, and so is the opportunity for individual contribution. There are many qualities of biochar, and they depend on the kind of biomass, process, and conditions used to create it. There are yet more combinations of soils, crops, and climate zones. All of these variables and combinations need to be tested to promote rapid learning and effective application. Thus, “backyard” research can be as useful and important as formal institutional study. One of the encouraging aspects of biochar is that it can be applied widely, yet needs to be localized. There are economic and environmental costs to transporting the bulky biomass material used to make biochar (the feedstock) over any considerable distance from its origin. The feedstock is best processed locally and the biochar incorporated into local soils, utilizing particularized local knowledge about conditions relating to climate, soil, crops, and species diversity. Abundant feedstock biomass is widely available—without deforesting, and without competing with food. At present, vast amounts of biomass are left to rot or burned in field, forest and landfill, or are used inefficiently in primitive and polluting stoves. Granted, it does require care to gather and use this biomass harvest sustainably, and there are competing needs for it. However, biochar does not have to compete with compost, because biochar can still carry the nutrients in the biomass to the soil, and works best in combination with compost. Furthermore, biochar does not compete with food; rather, biochar shows great promise for enhancing food production and reducing fossil fertilizer use. Biochar also has the promise of increasing the supply of biomass over time, as soils improve and productivity increases. Marginal and degraded soils exist in countless locales throughout the world, and must be improved as soon as possible in order to restore soils, increase food production to feed expanding populations—and recapture our historic emissions. My own exposure to small-scale biochar came via a project to develop low-emission, low-cost biochar kilns for small farms and villages. The focus has been to prove that emissions from small biochar kilns can be controlled to best-practice standards, while still using simple designs, accessible materials, simple cues for checking emissions, and basic or no instrumentation. Invited to present at an environment day in my local community, I was prepared to carefully explain the science on climate change in order to position and justify biochar, and then demonstrate a small low-tech, backyard biochar kiln. Everybody clamoured to see only the demonstration, so they could go home and try it! 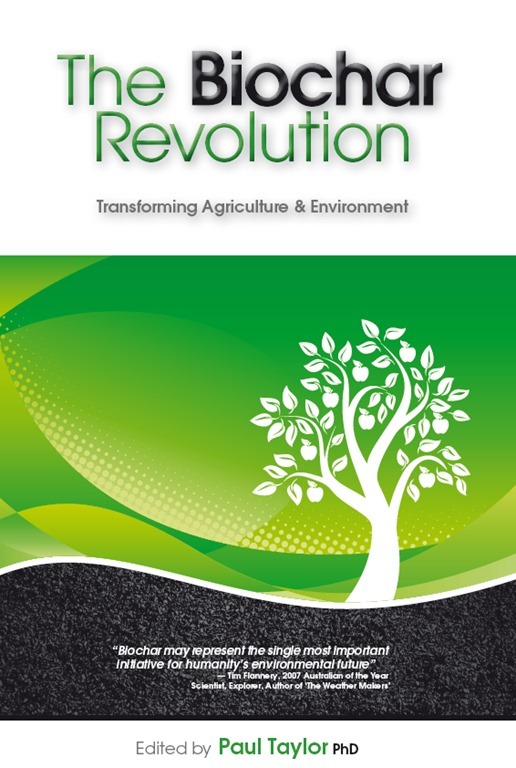 That real world, grass-roots experience, coupled with the troubling global context, inspired my book The Biochar Revolution – Transforming Agriculture and Environment. It aims to support gardeners, enthusiasts, small property owners, farmers, communities, and municipalities who wish to explore making and using biochar to do so via techniques that are safe, low-emitting, resource-efficient, and effective for their local soil and crop. That way we will do the most good and the least harm as we learn to achieve the local and global outcomes we sorely need. In doing so, we revive legacies left to us by the ancient Amazonians and others, while being informed by modern science—and reaping the benefits of our own contemporary ingenuity. Biochar indeed seems to be taking off. This year the international Ithaka Institute for Carbon Intelligence was founded, along with a new Biochar Journal for the general public. In Switzerland this July, at the Ithaka Institute, we commissioned a new kind of very simple and effective biochar kiln, where we make the biochar in an open metal cone like a fire pit. We called the kiln the Kon-Tiki because we felt we were on a voyage of discovery to understand and bring into the modern world how the ancients made their biochar. Already these kilns have been made in Australia, Canada, California, England, Ireland, Hungary, Switzerland and South Africa, Nepal, India, Indonesia, Hawaii, Germany and Malawi. The story is published in the new Biochar Journal here. At the first US Biochar School in California the trend was clear: Biochar is being combined with compost and effective microorganisms to make soil amendments that bring exceptional yield increases. In August I did a biochar presentation in Calgary, Canada, which seemed to be a mecca for Permaculture, with participants from several permaculture organizations eager to hear what biochar could do for them. 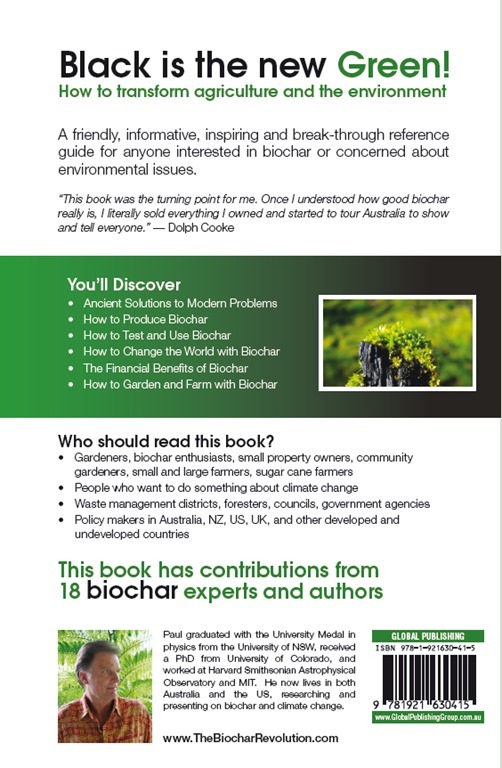 There are several initiatives around the world including from Switzerland, Australia and the US to start a biochar training courses along the lines of Permaculture courses. Pictured below is the front and back cover of the book, you can click on it to see a larger image and read the book description. 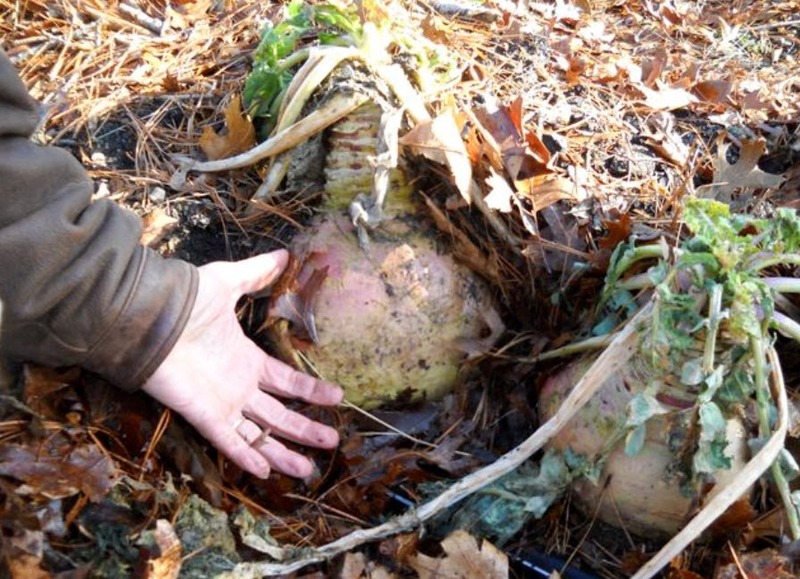 The turnips in the rows tilled in with biochar were twice as big as in the rest of the field. After only 30 days of growth they were so much bigger and greener that they looked like a different species. Kon-Tiki Kiln Deep Cone Kiln firing carpentry scraps. 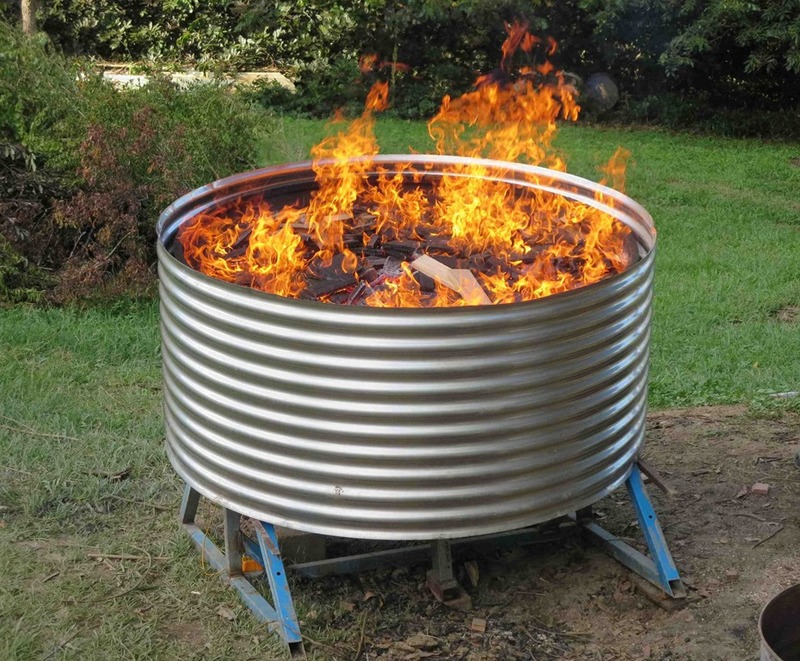 The large cone kiln can turn wood or green waste into biochar easily and cleanly. Biochar and imbedded worm farm in a horticulture. Planting mixture is 10% biochar, 40% worm castings and 40% humus/forest soil. Committee on Environment and Natural Resources, National Science and Technology Council. “Scientific Assessment of the Effects of Global Change on the United States.” Government Report, May 2008. http://www.climatescience.gov/Library/scientific-assessment/(accessed August 16, 2010). Scientific American. “How Acidification Threatens Oceans from the Inside Out.” August 2010. Rischard, J.P. High Noon 20 Global Problems, 20 Years to Solve Them. New York: Basic Books, 2002. 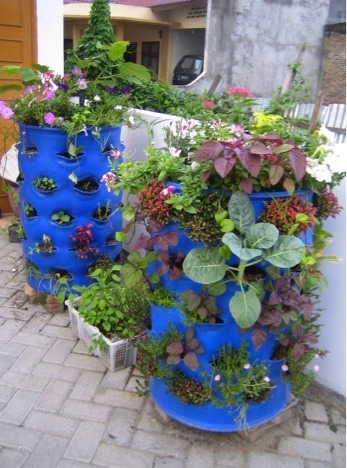 This entry was posted in Gardening Information and tagged bichar benefits, Biochar, biochar history, Kon-Tiki Kiln, Paul Taylor, soil fertility, sustainable gardening, tera preta, The Biochar Revolution. Bookmark the permalink. Excellent article explaining the current understanding of this method. Will have to get the book! After much searching on the internet, and not finding a thorough discussion of all the issues of “burning” biomass, it is a relief to read what you have to say about it. We have truly sand soils in Florida, USA and the biomass we use as compost, buried wood, manure – they ALL disappear within a very short time due to the warm climate and constant humidity. This offers the possibility of amending the soil below the surface with biochar, before adding the traditional mulches. Could be a workable solution! Our only concern we have is a modern one – does the burning of the biomass concentrate the toxins that were absorbed by the plant material while alive? With so many chemicals used in so many settings, that is an area we hope will be researched to help guide us. Biochar is a natural phenomena, built up in soils from forest and grass fires. These leave a small residue of stable pyrolytic carbon which has built up over millions of years to be a substantial and beneficial fraction of the soil carbon in many soils. Most organic toxins in the plants are of course volatilized or combusted. Some mineral toxins could be concentrated in the biochar, but are held tightly and less likely to be taken u by the plant than from composted residues. It has been found that plants grown in biochar amended soils show reduced uptake of toxins. Of course, your question is important and must be satisfactorily answered scientifically in large ongoing field trials before mega applications of biochar to our agricultural land, but with appropriate observation as you experiment, and not using toxic feedstocks such as treated lumber, you can feel safe applying biochar.